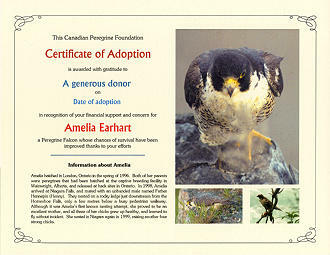 Or click here to go straight to the Adoption form. 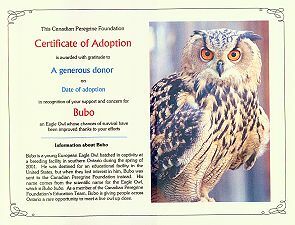 Note: the fuzziness in the samples below is because we have reduced the size of the images to make them load more quickly - actual full-size adoption certificates are in focus. 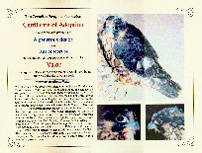 Following their deaths, Pounce-Kingsley and Victoria were removed from the regular adoption program. 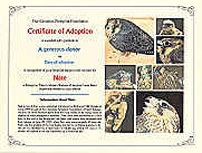 However, we have created special memorial certificates, which can be requested on the standard adoption form. 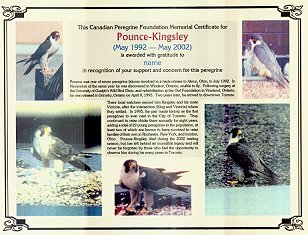 Funds raised through these memorial certificates will be put toward the cost of care for Pounce-Kingsley and Victoria's final brood. Project Adoption is an opportunity for you to sponsor a wild peregrine falcon or one of the Canadian Peregrine Foundation's educational birds for a period of one year. 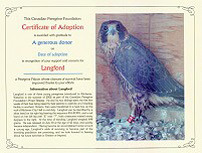 By doing so, you will learn about the life of 'your' bird, and will be assisting the Canadian Peregrine Foundation in caring for these birds. 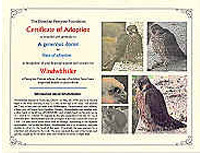 What is an adoption package? 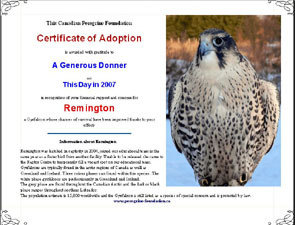 You will receive a personalized 8-1/2" x 11" laminated adoption certificate, with one or more colour photos of your bird, and a written profile highlighting the age, location, and special features of your bird, including (whenever possible) its band numbers. How much does Project Adoption cost? 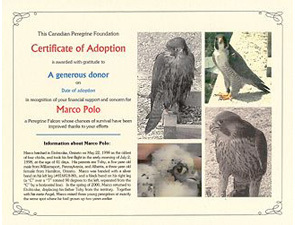 How will Project Adoption help raptors? 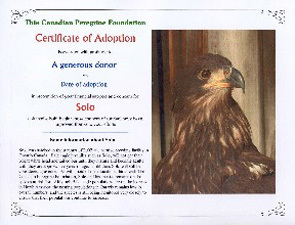 The money raised through Project Adoption will be directed toward emergency healthcare. 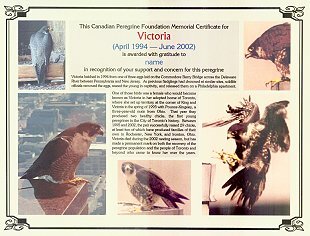 For example, during most years, at least one of the urban peregrine chicks in southern Ontario requires medical attention, and treatment can be expensive. 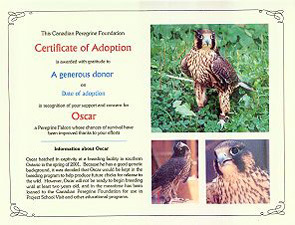 The cost of fixing a broken wing and rehabilitating a raptor for flight can range from several hundred to over one thousand dollars. 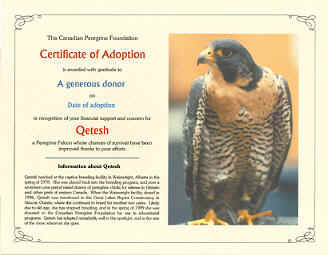 We will also use some of the proceeds from Project Adoption to help fund Project Watch'-em, our annual dawn-to-dusk surveillance of urban peregrine nests designed to rescue young chicks which get into trouble on their first few flights. 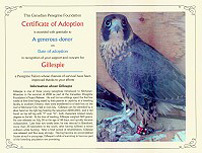 Finally, if you choose to adopt one of the Canadian Peregrine Foundation's educational birds, you will be helping to pay for the care of these birds. 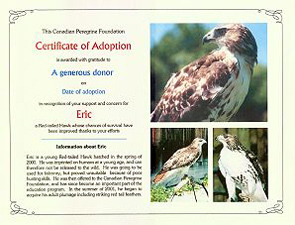 Which raptors are available for adoption? 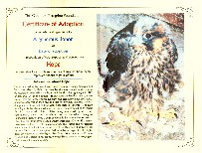 There are many birds of prey currently available for adoption. 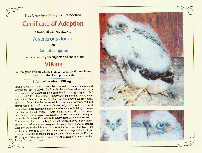 Any of the raptors pictured on this page are available for adoption. 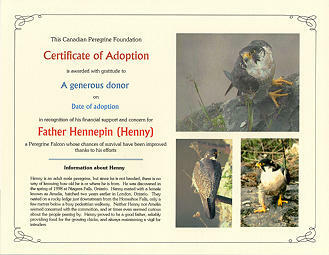 The drop list on the adoption form will also list the birds of prey currently available. 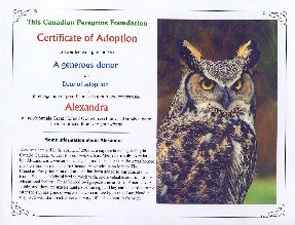 More raptors will be added over time. 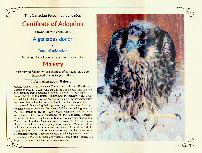 NOTE: for some of the birds listed, there is no recent information available because they have left their previous territory and have yet to be discovered elsewhere. 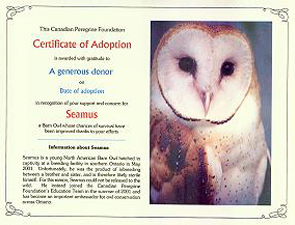 How can I request an adoption package? If you have any questions, comments, or suggestions about Project Adoption, please e-mail us.